Sprawling Munich (München), home to some 1.5 million people, is the capital of Bavaria and one of Germany’s major cultural centers. It’s one of Europe’s most festive cities, and its location, at the foot of the Alps, is idyllic for your vacation experience. Thomas Mann, a longtime resident of Munich, wrote something about the city that might have been coined by an advertising agency: “Munich sparkles.” Although the city he described was swept away by two world wars, the quote is still apt. Munich continues to sparkle, drawing temporary visitors and new residents like a magnet from virtually everywhere. Some of the sparkle comes from its vitality. With its busy factories, newspapers and television stations, and service and electronics industries, it’s one of Europe’s liveliest places. More subtle is Munich’s amazing ability to combine Hollywood-type glamour and stylish international allure with its folkloric connections. Few other large cities have been as successful as Munich in marketing folklore, rusticity, and nostalgia for the golden days of yesteryear. This rustic ambience coexists with the hip and the avant-garde, high-tech industries, and a sharp political sense, which is what lends the city such a distinctive flair. As Americans migrate to New York, Austin or San Francisco to seek opportunity and experience, so Germans migrate to Munich. 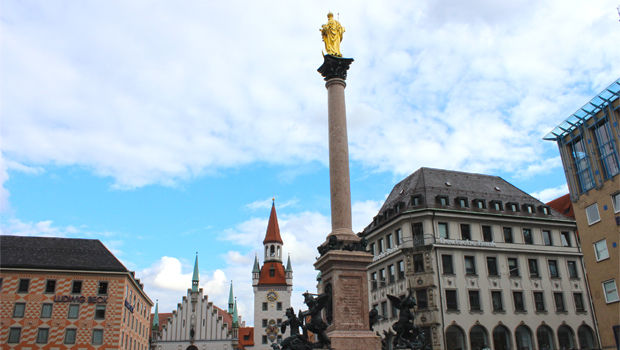 The city is full of non-Bavarians; in fact, more than two-thirds of the German citizens living in Munich have come from other parts of the country, and tens of thousands are expatriates or immigrants from every conceivable foreign land. Sometimes these diverse elements seem unified only by a shared search for the good life. Outsiders are found in every aspect of Munich’s life. The wildly applauded soccer team, FC Bayern München, is comprised almost entirely of outsiders — Danes, Belgians, Swedes, Prussians. The city’s most frequently quoted newspaper mogul (Dieter Schröder) and many of the city’s artistic movers and shakers are expatriates, usually from northern Germany. What’s remarkable is the unspoken collusion of the whole population in promoting Bavarian charm, despite the fact that real dyed-in-the-wool Bavarians risk becoming a distinct minority in their own capital. Munich’s self-imposed image is that of a fun-loving and festival-addicted city — typified by its Oktoberfest. This celebration, which began as a minor sideshow to a royal wedding in 1810, has become a symbol of the city itself. 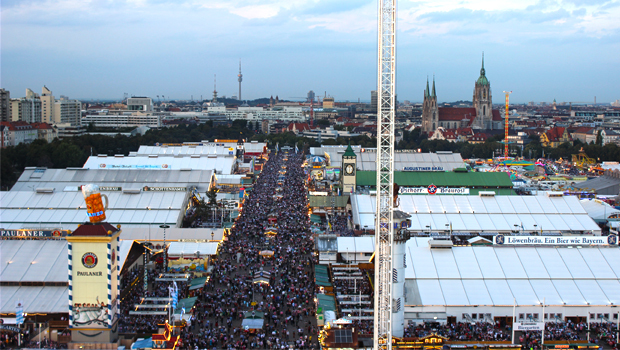 Redolent with nostalgia for old-time Bavaria, it draws more than 7 million visitors each year. For these 16 days every fall, raucous hordes cram themselves into the city to have a good time. Oktoberfest is so evocative, and so gleefully and unashamedly pagan, that dozens of places throughout the world capitalize on its success by throwing Oktoberfest ceremonies of their own. These occur even in such unlikely places as Helen, Georgia, in the U.S., where citizens and merchants reap tidy profits by wearing dirndls and lederhosen, playing recordings of the requisite oompah music, and serving ample provisions of beer in oversize beer steins. No one has ever marketed such stuff better than Munich, but then, few other regions of Europe have had such alluring raw material from which to draw. A somewhat reluctant contender for the role of international megalopolis, Munich has pursued commerce, industry, and the good life without fanfare. You get the idea that in spite of its economic muscle and a roaring GNP, Munich wants to see itself as a large agrarian village, peopled by jolly beer drinkers who cling to their folkloric roots despite the presence of symbols of the high-tech age. Underneath this expansive, fun-loving Munich is an unyielding, ongoing conservatism and resistance to change, both religious and political. But as a symbol of a bold, reunited Germany forging a new identity for the 21st century, Munich simply has no parallel. As such, it continues to exert a powerful appeal.